Dai Mahou Touge or Magical Witch Punie-chan reminded me right off the bat of another series, Bokusatsu Tenshi Dokuro-chan. That wasn’t a good sign considering how much I hated that show. However Punie is something Dokuro-chan wasn’t, a truly funny and entertaining dark comedy/parody. The premise of Punie-chan is pretty basic. Punie is a princess from another world sent to earth for a year by her mother for "training". It is unclear what this training is beyond defending herself against an onslaught of characters out to kill her, including her own siblings. The series is episodic in nature and have very little to do with each other from a story standpoint. While the plot is really nonexistent what this show does so well is the humor. It is crude, violent, and decidedly dark but very funny. Fans of black comedy and people who like seeing the role reversal of cute moe characters behaving out of their norms will love this series. Characters in this show are the strongest point. Punie shines as the sweet and adorable moe princess with a dark evil side a mile wide. She’s not particularly likable but I couldn’t help but find her amusing. She doesn’t treat anyone very well, such as using her friends to spring traps meant for her, stealing tests, and ruining love lives. Still she manages to be a very funny character. The supporting cast is very strong as well. Punie has a number of hilarious rivals who she must defeat. The end result for them is a lot of pain and broken bones. Everyone is sure to have a favorite or two from this group. The art and animation are very good. The color palette is vibrant and character models I think are very fitting for their personalities. I found the mix of styles, from the super cutesy looking yet dark magical world to Anego and her gang of tough girls. This anime shows you can have violent and bloody humor without the excessive and disturbing amount of gore. The cast is wonderfully acted and all the bones are broken with disturbingly real sounding effects. The OP/EN songs are excellent and fit the tone of the show perfectly. Overall I really enjoyed this show and found it to be one of the best dark comedies I have seen. Those who loved the aforementioned Dokuro-chan will like this, but I think those of us who were turned off by its gore and cruelty but still like this kind of humor will find Punie-chan much easier to stomach. Dark, twisted, tainted and through'n-through madness. If you are not a fan of dark humour and twisted jokes you will not enjoy this series. But, if you do enjoy stories and gags which are just completely wrong, in every little way, then you will love this show, because it delivers encore upon encore of wretched, bizarre and just plain evil jokes and enjoyment. There is no overall plot really, the story revolves around the heroine, Punie Tanako, who is sent to the human world from her home-world of "Magic Land", to study and grow stronger so that she can eventually inherit the title of Queen. And that's about it, the rest of the show is just glimpses of how the little girl deals with everyday life in the human world. So if you're hoping for an epic plot, you won't find it here. What you will find however is great, great and once more, great characters. Punie is just the epitome of awesome in every possible way. Not only is she adorable and cute, but she's also so gruesomely dark and sinister, sadistic and cruel and just blatantly evil that you'll fall in love with her at first notice. This is aided when her murderous mascot (who very much would like to cut her throat) appears and adds even another layer of comedic madness to the show. You'll get to see Punie abuse her friends, mercilessly insult them without a second thought or concern for their feelings and of course, get to see her trademark wrestling/submission moves as she breaks joints and limbs recurringly. The opening-theme and animation is also simply wonderful. The cheery tune and peppy beat makes for a nice contrast as we get to see the little hellraiser dance around while the background is set on fire, while smiling ever so innocently, almost laughing I would imagine. The sound is clear and the voice-acting is fits in perfectly. You'll even find a certain audio-based gag in the episode where Anego (one of Punie's "friends") go on a date with a boy, if you listen close enough that is. The voices fit the characters very well, and as usual the seiyus have put emotion and effort into their characters, making them very enjoyable to listen to. In conclusion, faint of heart should not watch this, and people who value their childhood dreams about fairy tales and magical kingdoms should also probably stay away. But everyone else, who likes to laugh, should definetely, without a doubt, watch this as soon as they can. 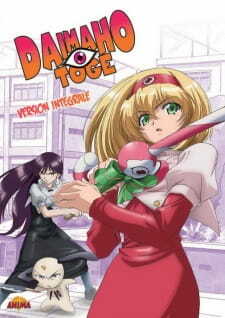 Dai Mahou Touge is an hilarious, parodic series from the original manga adaptation. To start things off, it has no actual plot other than what is being stated in the synopsis, it features some hilarious parodic moments from a few famous movies and series and its generally a short series consisting of 8 episodes in total. (2 episodes of 12mins each in one). Considering the series is somewhat plotless, I'm gonna talk a bit about Tanaka Punie. Well to start it off, she really is the queen wannabe from her magical land considering she has a candy stick as a magical weapon and her well known, all famous 'submission' move where it either kills the person and the person comes back to life the next day or paralyzes the person in which making us think they are dead. But really, none of us can hate her considering she brings us serious laughter and joyful entertainment, weather she is in a happy or in a cold-blooded killing mood. Each episode are just merely daily school life activities where she gets accustomed to the living on Earth. While it may seem the events look ordinary, the parody events plays a major role. A few examples of these parody events includes famous cut scenes from the Initial D series and the Alien and Deer Hunter movies. If you still think this is an original comedy, well you are in for a treat. In conclusion it's for all comedy lovers or for anyone in general. "Lyrical Tokarev, Kill Them ALL!" I've decided that I like magical girl series. Nah, not the cutesy, childish stuff. The super-saccharine, gleeful murderous type. Split personalities, bloody messes, broken bones, and ultraviolence; now that's what I want to see! Well, it turns out there's basically a whole genre devoted to this dark, twisted inversion of magical girls, and Punie is top of the stack. Punie Tanaka is a girl sent by her mother, the queen of Magical Land, to study on Earth for a year in order to... hone her "queenly" skills. These apparently consist of: Cheating, ruining lives, destruction, sending your entire school to the hospital multiple times, and foiling near constant attempts on your life as the next-in-line to the throne by your pet, classmates, bitter rivals, unhinged monsters, and even your cute little moe blob twin sisters. Punie don't take no crap from nobody, and if anyone gives her any lip, she puts them in a submission hold and breaks their legs in seven places! I think she went to the Ice T school of the streets: TALK SH!T, GET SHOT!! Anyways, Punie is a very short (eight 13m episodes combined into four OVAs), rough and tough romp through the mean streets, and is it ever fun. If you enjoy dark humor, movie and tv parodies, and bone cracking destruction- this will drop a bomb on the mark. Punie has some great movie references, including a whole segment ripping off Apocalypse Now's famous helicopter scene, complete with Flight of the Valkyries! Punie, rather than allowing the class to learn that she's too stupid to do 8th grade math, calls in a nuclear strike on the school that will eliminate everything in a 100 million mile radius... only to be assisted by Paya and an Air Force pilot flying an Apache helicopter, who attack and destroy the classroom, including killing most of the students! This gives Punie just enough time to erase her dying friend Tetsuko's name off her paper, write hers in, and pass! Paya, in bouts with his PTSD and subsequent split personalities, has flashbacks to Vietnam with a pair of Full Metal Jacket and Platoon references. Another episode features an extended Initial D parody starring Anego, which is just plain hilarious. I have to say that the English dub is easily twice as funny as the Japanese, as well, with Veronica Taylor as Punie and Dan Green as Paya. Ms. Taylor absolutely nails the cutesy facade Punie puts up and at the same time sounds absolutely murderous when she gets serious. The additions to the script include more pop culture references, for added hilarity. Overall, a very funny, if too brief series. Definitely an underrated gem.